Do you have a project using products from our sponsor- Doodlebug Inc., or about(but not limited to) your mother, being a mother, beautiful flowers, featuring killer typography, or keeping a secret... well then you are in luck! 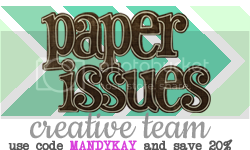 Link your project(s) up with us HERE on the Paper Issues blog and then take a moment to check out some of the other projects linked up as well. Don't forget to link us up to your project and leave us a comment so you can be entered into a drawing for a goodie bag of Doodlebug products! Love all the layers MK! Awesome page, Mk! You totally rocked the product!